Figure 1. The Killer Rabbit of Caerbannog. From Monty Python and the Holy Grail (1975). 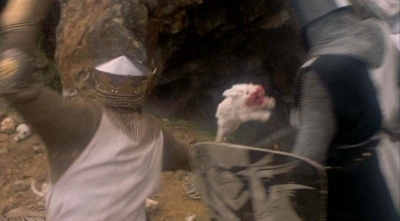 In the movie Monty Python and the Holy Grail, the Rabbit of Caerbannog was a seemingly innocuous leporid with “nasty, big, pointy teeth” and “a vicious streak a mile wide.” It appeared harmless enough, but was capable of decapitating a grown man wearing a full suit of chain mail. Although fictional, if this deadly rabbit was otherwise like any other rabbit, it could multiply quickly and devastate the British Isles similar to the way real rabbits have become an invasive nuisance in Australia. Fortunately, the diabolical beast could be killed by Holy Hand Grenade of Antioch. Now, imagine that the fictional hordes of brutish British bunnies are bacteria, and that the kill-by-thrill holy hand grenade is a mere protein. Meet peptidoglycan recognition protein 1 (PGLYRP1) encoded by our gene of the week, the PGLYRP1 gene. Figure 2a. Ye Olde Holy Hand Grenade of Antioch (HHGA) from Monty Python and the Holy Grail. Figure 2b. Thrill-Kill HHGA with targeting capabilities (TK-HHGA-TC). Figure 2c. The Protein equivalent of TK-HHGA-TC: PGLYRP1. Peptidoglycans are polymers of amino acids (hence the peptido- portion of the name) and sugars (hence the –glycan). These polymers are major components of the bacterial cell wall and are targets for antibiotics such as penicillin1. Because peptidoglycans are not typically found on the surfaces of eukaryotic cells, they are one of many Pathogen-Associate Molecular Patterns (PAMPS) that are recognized by Pattern Recognition Proteins (PRPs) as part of the innate immune response2. The PGLYRP1 protein, like other peptidoglycan recognition proteins (PGLYRPs), is secreted in mammals, dimerizes, and can kill a wide assortment of bacteria. Unlike other PGLYRPs which are typically found in mucosa and serum, PGLYRP1 is primarily found within, but not limited to, the granules of bacteria-gobbling polymorphonuclear leukocytes3. Oddly enough, PGLYRP1 does not compromise the bacterial cell wall to wreak osmotic havoc on the bacteria like many other mammalian antimicrobial peptides4. Instead, PGLYRP1 interacts with the peptidoglycan on the bacterial cell wall and activates the protein-sensing two-component systems that bacteria use to sense environmental conditions. In doing so, PGLYRP1 over-stimulates the bacterial stress response fooling the bacteria into shutting down biosynthesis (no more peptidoglycans, proteins, DNA, or RNA); lethally depolarizing its own membrane; and generating toxic hydroxyl radicals which induce oxidative stress5. In short, PGLYRP1 assists in bacterial suicide! Figure 3a. Pore-forming antimicrobial peptides which compromise the cell wall and wreak osmotic chaos. Figure 3b. PGLYRP1 stressing the bacteria to death like a bad physical exam. If that wasn’t enough, PGLYRP1 may also play an important role in inhibiting/killing cancer. By interacting with heat shock protein-70 (HSP70), PGLYRP1 can form a cytotoxic complex that can induce apoptosis in several tumor cell lines, while leaving normal cells unaffected6. CD4+CD25+ lymphocytes expressing the PGLYRP1 protein have been found to interact with tumor cells expressing HSP70 creating the cytotoxic complex on contact and inducing tumor cell death7. Additionally, the PGLYRP1-HSP70 complex can be secreted by CD8+ leukokine-activated killer (LAK) cells, but the secretion and binding of heat shock protein binding protein 1 (HspBP1) neutralizes the cytotoxic effects of the complex8 to minimize the collateral damage on the host. In addition to the antimicrobial and anticancer activities, PGLYRP1 has modulatory effects on inflammation with observed anti-inflammatory effects in experimental mouse models of arthritis9. In contrast, PGLYRP1 has pro-inflammatory effects in mouse models of psoriasis10, contact dermatitis, and atopic dermatitis11, and genetic variations in PGLYRP1 may even play a role in the development of asthma12 and inflammatory bowel disease13. Yep, that’s right—inflammatory bowel disease! In particular, polymorphisms in PGLYRP1 have been associated with susceptibility to ulcerative colitis. Researchers suspect that PGLYRPs play an important role in maintaining the gut microflora, and mutations in these genes can affect their efficacy of their gene products against gut microbes. Changes in the efficacy of the PGLYRPs could result in drastically different microbial communities in the gut resulting in inflammation and disease in the host. Furthermore, aging can affect expression levels of the PGLYRP genes. In fact, researchers recently discovered that PGRP-SC (the fruit fly homolog of PGLYRP1-4) levels decrease with chronic activation of the transcription factor, Foxo. With decreased levels of PGRP-SC, the fruit flies ultimately suffered from alterations in gut microflora, gut stem cell deregulation, and disease. By restoring the levels of PGRP-SC which were reduced due to age, scientists were able to restore the host-microflora balance in these old fruit flies and help them live longer, healthier lives14. The PGRPs play such an important role in maintaining the gut microflora, that pathogenic bacteria have evolved strategies to evade interaction with PGRPs. Just this month, researchers reported discovering gram positive bacteria producing autolysins in order to hydrolyze their peptidoglycans enabling them to evade the PGRPs in fruit flies15. With so many important roles (especially in the midst—no, guts of the yogurt/probiotics/gut homeostasis movement), it’s no wonder the PGLYRP1 gene has garnered so much interest as of late and will probably continue to do so in the future. Not bad for a gene with a name that looks like a string of amino acids! This post does not (in any way) advertise, advise, or recommend the use of yogurt or other forms of probiotics for improving gut homeostasis. Gene Wiki article on this PGLYRP1 is nearly completely empty. Would be great if any readers might want to fill that one in. If you do and you happen to also be excited about opportunities for “official” journal articles, get in touch with us about writing a review article for Gene!